Jill Lauriston has been painting in the villages of Provence since 1983, when she first stepped off the night train to Avignon with a paintbox. Other favourite painting locations are the Yorkshire Dales and coastline, as well as other areas of France, Greece, Spain, Portugal, Italy and Morocco. She has studied with a number of tutors over the years, and occasionally runs her own watercolour workshops and talks about her travels with a paintbrush. 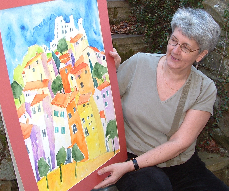 Whilst her preferred medium is watercolour, she also uses acrylics, pastels, charcoal and mixed media. Her favourite subjects are flowers and landscapes, but she also enjoys abstracts, and has been known to do portraits of her neighbour's cats! She has exhibited regularly in Sheffield at the Great Sheffield Art Show and with the former University Fine Art Society, at the London Road Gallery, in the local Open Studio event, and also at Kelham Island and other local arts and craft fairs, where she also shows her unique hand-made felt hats. She has also exhibited work in Nottingham, Sowerby Bridge and London.